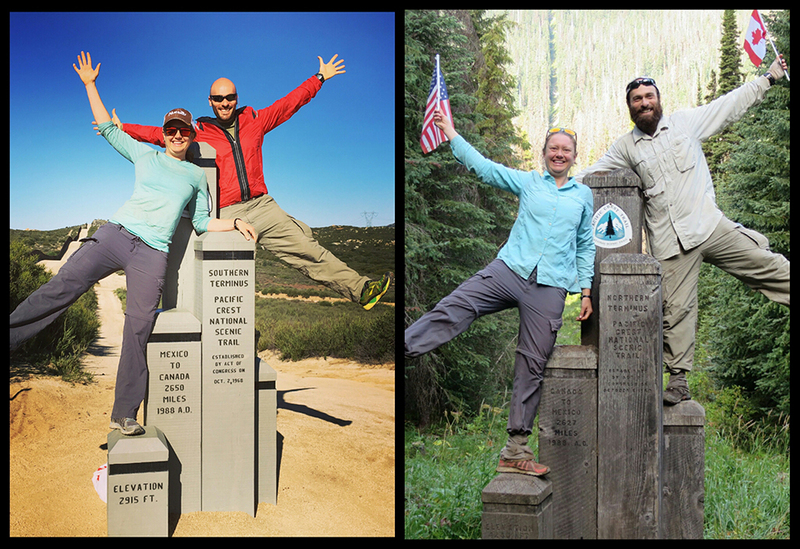 California State University, Northridge alumnus Andy Dischekenyan ’10 (Recreation) and his fiancée Laurie Kramer completed the Pacific Crest Trail this year. Six million would make one rich. And so, six million steps made California State University, Northridge alumnus Andy Dischekenyan ’10 (Recreation) just that in terms of life experience. Across the Pacific Crest Trail — a hikers’ dream that spreads across 2,650 miles from Mexico to Canada along the Western states of the U.S. —Dischekenyan and his partner Laurie Kramer journeyed for 171 days – from April to September. They got up close with the blooming cacti of the California desert, tromped through the Sierra Nevada mountains blanketed in snow and marveled at the stunning, rich green hillsides of the Goat Rocks Wilderness and North Cascades in Washington. They saw a bear, mountain goats, elk, deer, rattlesnakes and numerous other critters. And during one lengthy life-changing experience, they committed to another by getting engaged near the end of their journey in Washington at their 2,000-mile marker. “Every step somehow contributed to my richness — that full heart that I came back with and still have to this day,” Dischekenyan said. Dischekenyan said he completed an enrichment program prior to the hike that gave him the courage and confidence to set forth on and complete his journey. That program was really an education. And it was called CSUN. Like his Pacific Crest Trail trek, Dischekenyan took a lengthy journey to receive his degree. The journey began in 2001 and was interrupted in 2004 when he stepped away from the university. During that time, Dischekenyan experienced depression and became overweight. But he decided to return to school and change his major to Recreation and Tourism Management after becoming intrigued by the possibilities of what he could do with the degree. Then he blossomed. Dischekenyan took three classes with Yost: Leadership in Recreation & Human Services, Entrepreneurial Ventures in Recreation, and Promotion of the Recreation Experience. Yost’s leadership classes are unique. Students have a say in what their assignments are and how they are graded. The assignments are also a bit unusual. For example, when Dischekenyan was in Yost’s class, one of the assignments was to have students review children’s books, such as The Little Engine That Could, and report how they teach leadership. In Spring 2013, Dischekenyan was a guest lecturer during one of Yost’s classes after he hiked the John Muir Trail. He also met Kramer while on that hike. Based on the evaluations, students in class learned a great deal from your time together and in their own words found your presentation: Interesting, insightful, amazing, WOW and ridiculous – I assume that’s in the best possible sense! And they found you inspiring, daring and adventurous. When it was time to take the PCT trek, Dischekenyan said he was prepared because of his CSUN education. He knew how and what to eat along the way, how to sustain energy, how to sleep in the wilderness and problem solve. He said there was only one dangerous incident on the trail. Because of El Niño, snowmelt made rivers more perilous. Kramer went in the water on one occasion and nearly got swept away, but managed to pull herself to land. Along their path, Dischekenyan and Kramer kept a running blog called Andy and Laurie Hike the PCT. They used their cell phones to upload posts and photos of their adventure. Today we crossed the 2,000-mile marker. Laurie was ahead of Andy, lost in her own thoughts. He called to her to stop. She did and walked back to where he was standing. We congratulated one another and kissed as we do normally. However this time, there was more to the celebration. We are excited to spend the rest of our lives climbing mountains, biking up hills and traveling the world – together. We laughed at ourselves as we tried to stretch the plastic ring so it would fit on Laurie’s finger. Neither of us was sure which hand the ring was supposed to go on so Laurie resorted to sucking on the candy instead. Dischekenyan returned home, admittedly a little down because he was missing the daily exhilaration of the hike. But in the two months since he has been off the trail, he has started on a new path in life — he plans on using his entrepreneurial spirit and his experience to create a food line for hikers and backpackers. His former professor believes that he’ll be successful in that venture as well.